Davao City has a lot to be thankful for this year. First off, our beloved Mayor Rodrigo Duterte is now the country’s new President and is received warmly by the Filipinos all over. Second to none, life here in Davao City is getting gloriously awesome by the day. What more could we ask for! Thank you, Almighty Father for all these blessings! And it is that time of the year again where we are celebrating the gift of our bountiful harvest – Kadayawan Festival. This year’s celebration will be a reflection of our President’s ways, simple and straightforward. 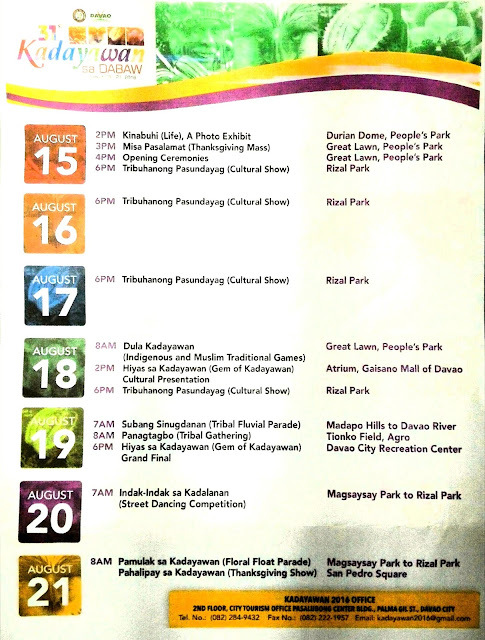 And to give you a guide on when, what and where events are taking place this 31st Kadayawan Festival, I’m sharing here with you the Official and updated Calendar of Events.